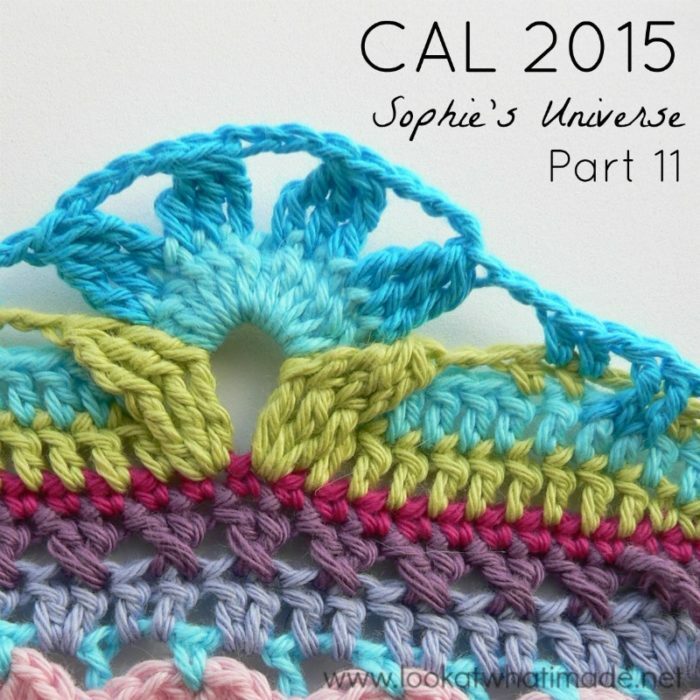 Good morning and welcome to Part 11 of the Sophie’s Universe CAL 2015. This week we have only 4 rounds, and they are a repeat of Sophie’s Garden…which means that your long side/short side days are at an end (after one more round). Each and every one of you should feel immensely proud of yourselves for having gotten this far. I am immensely proud of you!! I don’t think there is anything I can throw at you now that you won’t be able to handle. 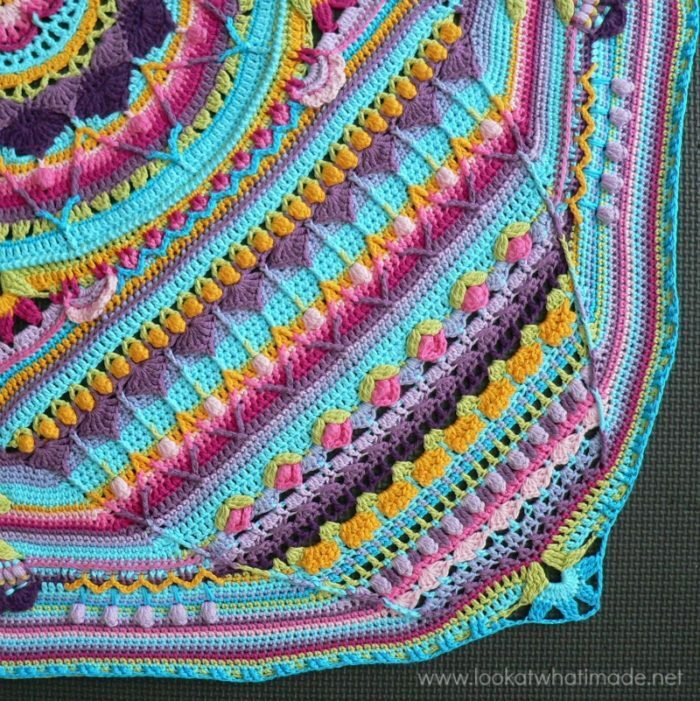 **Part 11 VIDEO TUTORIAL** by Esther Dijkstra from It’s All in a Nutshell. Please Note: Esther says Part 12 at the start of the video, but it is definitely Part 11. *If you are making the small blanket and using the same colours as me, you should have 9 g (25 meters) of Canary left at this point. You won’t be using any Canary this week, but next week you will be using it for the last time and you will need 7 g (22 meters). If you don’t have enough Canary left (and you don’t want to buy more), you can use Violet for that round instead. **If you are making the medium blanket and using the same colours as me, you should have 27 g (75 meters) of Dark Turquoise left at this point. You will be using 14 g (39 meters) in Round 84. This will be the last time that you use Dark Turquoise. Tr Cluster: Tr3tog – Same as the Cluster, but with tr’s instead of dc’s. See this tutorial. 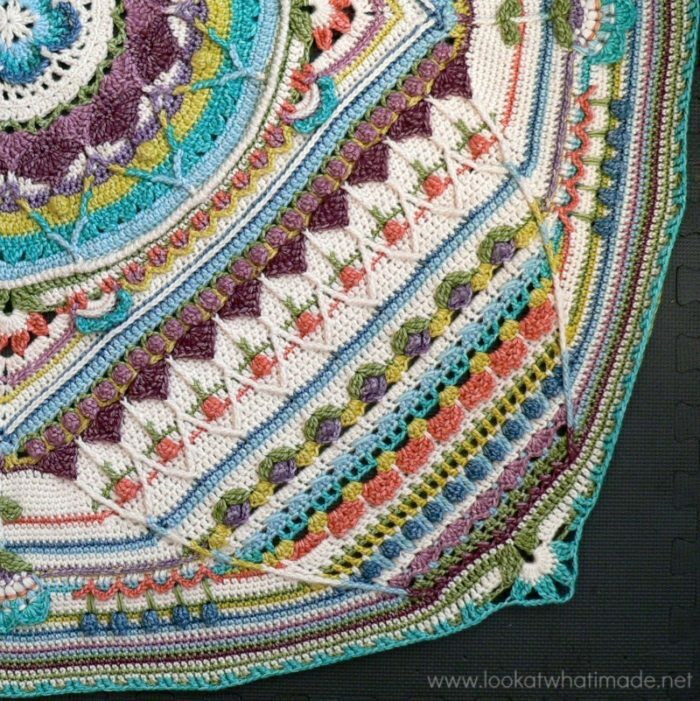 Please note that we will be working around the front posts of the stitches when creating the leaves in Round 83, not into the tops of the stitches as in this tutorial. You can find the links for Rounds 1 – 80 HERE. This round marks the repeat of the corner flowers from Round 26. It is not the same as Round 26, though. This is also the last round that will have 8 sides or facets. 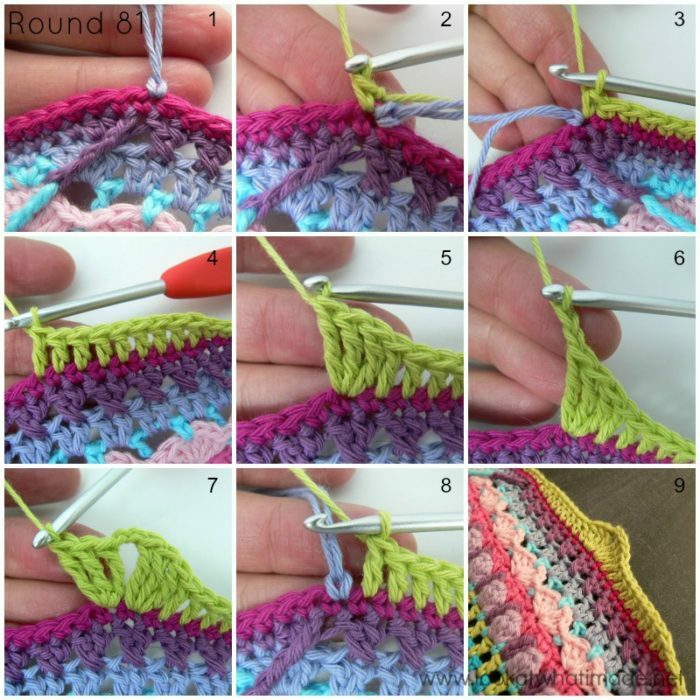 Join your yarn by making a standing single crochet in the marked sc at the start of any short side (in other words, the sc made into the fpdtr from Round 79) – see Photos 1 and 2. Sc in the next 119 st’s. The last sc should fall in the marked sc at the end of the short side (in other words, the sc made into the fpdtr from Round 79) – see Photo 3. *Long Side: Dc in the next 9 st’s (Photo 4). Make 3 tr’s in the next st – see Photo 5. Ch 2 – see Photo 6. Make 3 tr’s in the next st – see Photo 7. This will be your corner in the next round. Dc in the next 9 st’s. The last dc should fall in the sc before the sc made into the fpdtr from Round 79 (in other words, in the sc before the marked sc) – see Photo 8. Photo 9 below shows you what your 4 (very short) long sides should look like. These “bumps” will form the corners in the next round. From this point on you will again only have 4 sides. Whoohoo! 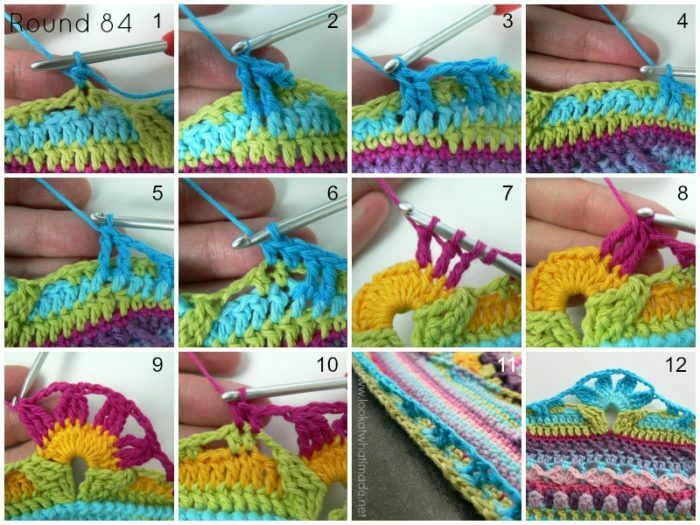 Join your yarn by making a standing double crochet in any ch-2 corner space around. Into the same ch-2 corner space: (Make 5 more dc’s. Ch 3 and sl st into the third ch from the hook to form a picot. Make 6 dc’s). It will be a tight fit getting all 12 dc’s into the corner space. Squish them up good! This is your first corner made (Photo 1). Repeat from * to * 3 more times. Omit the last corner on the last repeat. 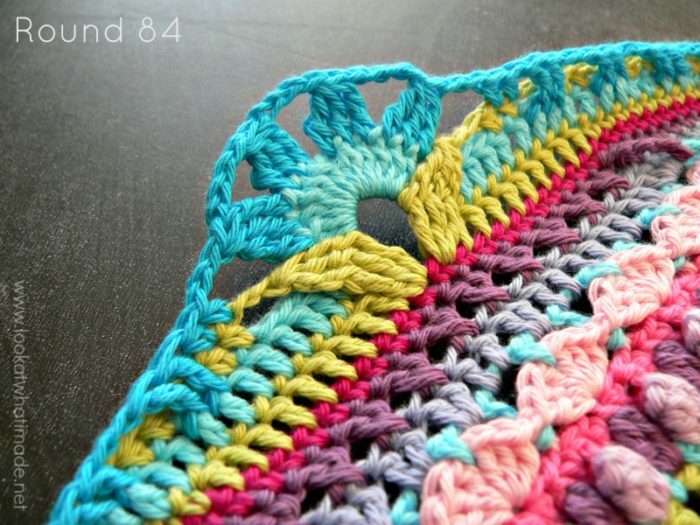 Join to the standing double crochet with a sl st. Fasten off and work away your tails of yarn. Photo 9 shows what your corner should look like. This round is a repetition of Round 28, with a few (ok, a lot) more repeats between corners. When you make the corners in this round, they will seem too tight for the round. Do not worry about it. At this point your blanket will look like a bowl. Don’t worry about that either! Do not forget the ch-2 spaces that are in bold and underlined below. I keep forgetting them! 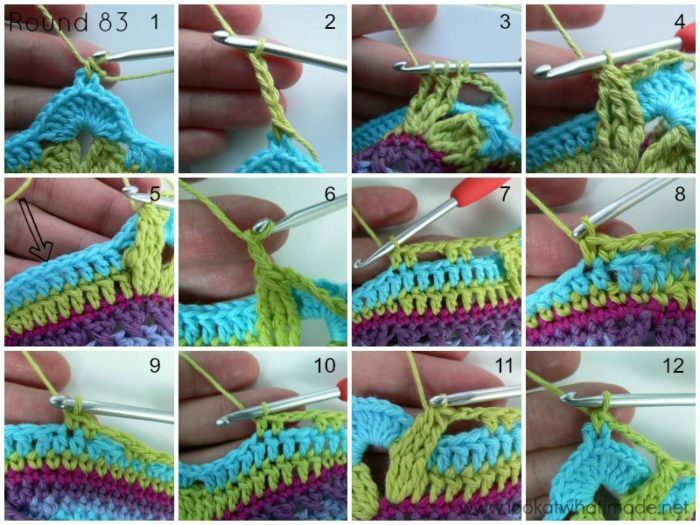 Join your yarn by making a standing single crochet in any corner ch-3 picot (Photo 1). Repeat from * to * 3 more times, omitting the last sc on the last repeat. 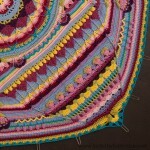 Join to the top of the first sc with a sl st. Fasten off and work away your tails of yarn. Once you have completed the round, push the (ch-4, sc, ch-4) bits in each corner to the back of your work, never to be seen or used again! Except for 16 stitches, you will be working only into the stitches of Round 82 in this round. When working into the st’s from Round 82 below the ch-2 spaces, work in front of the ch-2 spaces, not over them! 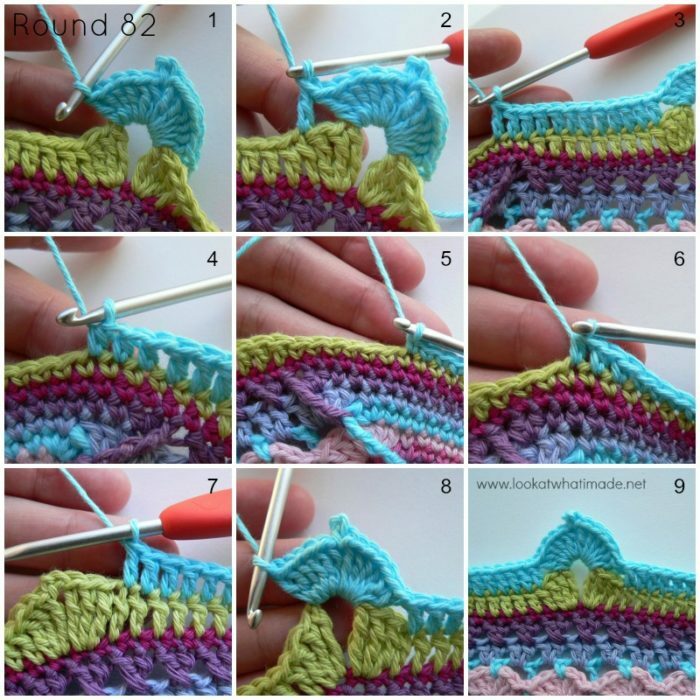 Join your yarn by making a standing half-double crochet in the second hdc from Round 83 on any side (Photo 1). Repeat from * to * 3 more times, omitting the last hdc on the last repeat. Join to the top of the first hdc with a sl st.
At this point you won’t have a perfect “square” yet. Next week (and the week after) we will be rectifying that. Just popping in to say I’m about to start part 11… yes I know I’m behind you all but who minds! 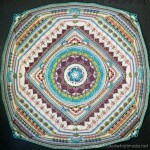 Where would you like me to post my image of me blanket and me hobbie-(profession)? Hi Petrina. I would love to see some photos. Are you on Instagram? My sister, who lives in Michigan, and I, in Ontario, are working at the same time on the medium-sized Sophie. We’re just having so much fun! Your design and instructions are fantastic. I’ve never worked on a project that I’ve enjoyed so much. Thank you thank you thank you. I’m on row 82 and I’ll be lucky to have enough of the Canary Yellow to finish the row and it looks like I’ll need Canary Yellow for two other rows as well. I followed the instructions on using a 3.5mm hook to start and changing to a 4mm after Part 3. I can’t believe my tension can be so different from yours. I got 2, 50g balls of the Canary Yellow in the kit of Softfun that I ordered from Wool Warehouse. Thanks so much for all your creative abilities that you so kindly share and for all your hard work answering all these questions! Hi Suzanne. How special that you two can share this journey. Did you go up a hook size again at the start of part 8? If you did, it will vastly impact the yardage needed. Even if you didn’t, I have come to realize I am quite a tight crocheter and most people work to a much more relaxed tension than I do. 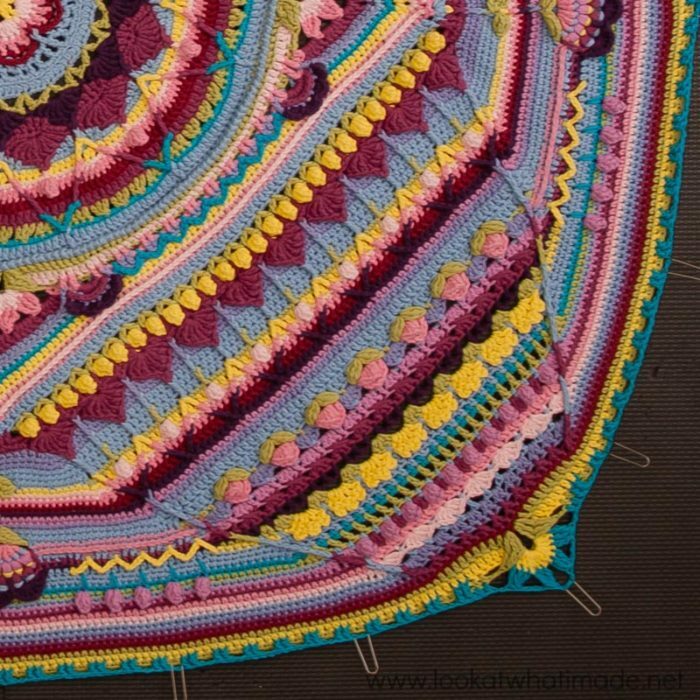 We did run into tension issues when we did the cal, which is why I specify, in some parts, when it will be the last time you use a specific colour. Have you had a look at the yardage per round tables supplied under ‘Helpful Templates’ in the information post? That should give you a good idea of how much more you are using than I was at a specific point, as well as total yardages used. Yes! I’ve caught up! Well, mostly. At least now I can start this week’s instead of being several weeks behind, phew. Thanks for all the time and effort you have put into this project and last years CAL. I am living in China and so far from home, in the US, and family. Being able to crochet has brought home a lot closer. (Thank goodness I brought my hooks) Many grandmas in China knit. 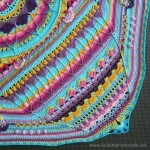 They knit beautifully, but not so many crochet. However, I have made a dear friend who crochets. 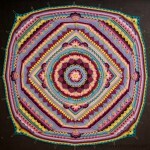 In fact it was crochet that brought us together. I noticed her beautiful purse. And, she offered to teach me and I offered to help her learn English. She taught me to make that beautiful purse, and now she wants me to teach her to to crochet the CAL afghan. The only barrier is our languages. We are both trapped, she in Chinese, and me in English, but the crochet hook and yarn allow us to communicate. 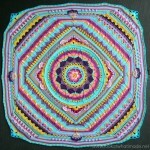 I finished this weeks four rounds Last Sunday afternoon. been waiting all week for Sunday to come. Love the CAL. I was wondering if any more of those delightful roses are going to be included. I just adore them. God bless you both and all you do to make so many people around the world so happy. I also have a niece called Sophie! I am hoping she will like one of the Sophies I am making and cherish it. 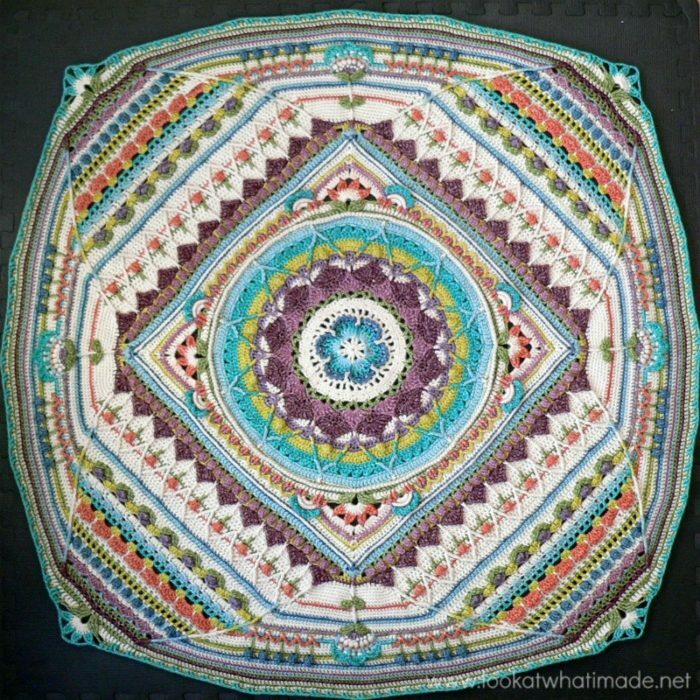 I taught myself to crochet a couple of years ago and am quite good at Granny square blankets, I never dreamt I would be able to follow a pattern, especially for something as beautiful as this, but you are amazing, the instructions make sense (once I figured out that what I thought of as a treble you call a double) the pictures are a godsend and you are a genius, how you are able to work out the stitches needed to create this is beyond me. I started this project 2 weeks ago and have been obsessed with it every chance I’ve had, but now I’ve caught up I’m not sure what to do till part 11 arrives. I’ve just noticed the squares you did last year, maybe I’ll have a go at them while I’m waiting. Lesley, I am so pleased that you are finding it addictive. 2 weeks to catch up is pretty good! I just happened upon this crochet along on Facebook. It is fabulous. I’d love to see a pic of the finished product. Is there somewhere to go to see that. (and what to expect). Also – is it possble to start from the beginning at this point. I’,m not that familiar with CALs. Is there a website I can go to where all the parts are listed and instructions are included? This is the place for everything up to and including part 11! Just finished part 11 :(. Now I have to wait another week!! Gonna be the longest week of my life..lol. 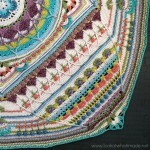 thanks again Dedri for this amazing pattern and all your little elves that help you test and edit!! Much appreciated!! I tried to download the PDFS of Part 11 and it’s just several lines in Spanish or something. The same thing is Horning with part 8 there is a recipe instead of the download. I hope you can fix it. Marie, Print Friendly is a third-party service that allows you to print what is on my site. Occasionally there is a hiccup. Clearing your browser’s cache might help. If that doesn’t work, try printing again a little bit later. It is not something that I have any control of, I’m afraid. Some people tend to encounter this more than others. Marie, the same thing happened to me with part 3 a few days ago. I checked it again and all it well and it printed fine. Not offended at all, Mabel. Thank you for flagging it up!! You’ll catch up soon enough, but don’t hurry, because then it will be over sooner! Thanks for this patern. I’m so proud of you and all the people who are crocketing this beautiful blanked. Also thanks for the lady who tranlate this patern. Things have been crazy and I feel so far behind at this point! I was on Part 9 (forget what round) and realized I had a MAJOR error several rounds back….no way to ‘fake’ around it…had to frog three or four rounds…heartbreaking to be sure! But it was done…and I’m so much happier that I did! So into Part 10 should catch up this week…and hopefully can get “Sophie 2″ caught up. If only we didn’t have to do other things – like housework and gardening and appointments, etc.! Dedri, not only are you a design genius, you must be some sort of mathematical genius as well to plan these complex patterns! there’s a lot of math here – and you amaze me! 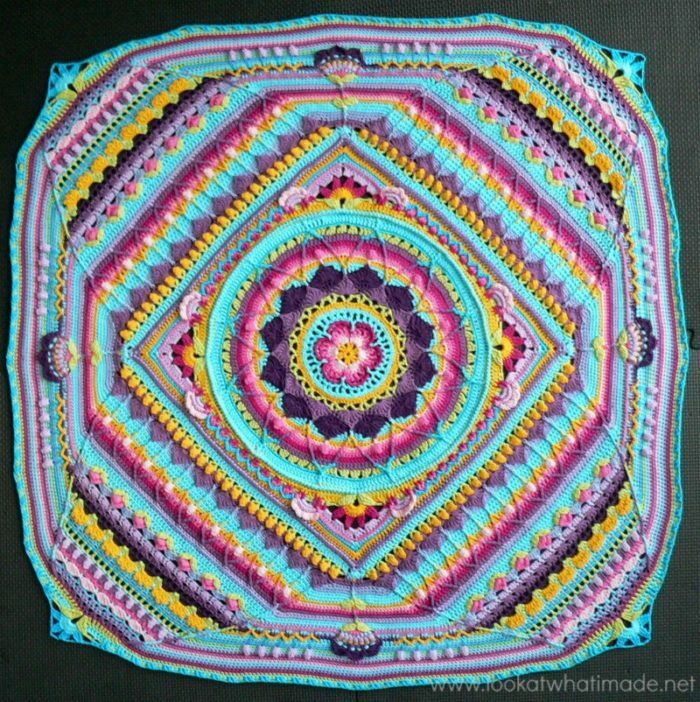 In the back of my mind I’m planning the ‘smaller squares’ that will turn Sophie into a bedspread for my huge California King bed. 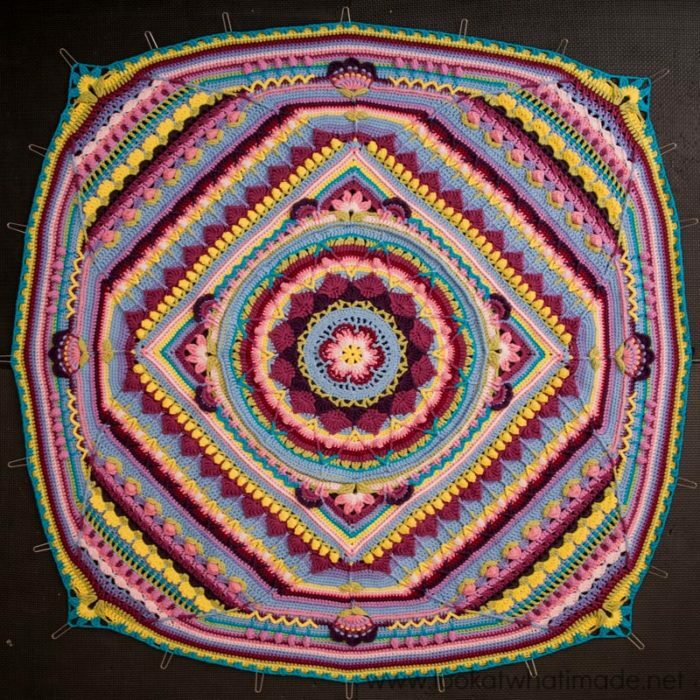 Have a lot of 8 inch squares, but want to enlarge to 12” – and incorporate colors and some stitch patterns found in Sophie…You did get my old brain working…which is a trick in itself! Thank you again! You are an amazing woman! I’m also happy that Part 11 is easy to make, as it is going to be a taff week with my other Hobby (funny, that this is actually the topic of this week) :-) I’m playing the Tenor Horn in a Brass Band and we’ll have our concert, there still lot of work to do for it… cross your fingers! I am SO far behind! Yet I wanted to take a minute and thank you for this amazing work of art. Keep up your inspiring work!